This paper analyses rural settlement patterns in the Lower Rhine frontier zone to elucidate the role of forts in the rural economy. Von Thünen’s model of rural marketing suggests that market centres attract intensive cultivation, making them identifiable through spatial analysis of rural settlements. Environmental factors that influenced production capacity, however, can also be expected to exert a strong influence on settlement location, so a multivariate method of spatial analysis is necessary. Using a process of comparative modelling with logistic regression analysis, I test the hypotheses that rural settlements responded to the location of market centres, both civilian and military. I use univariate analysis of settlement territories to identify influential local environmental factors and combine these into a logistic regression model. Then I add a market potential (MP) variable that quantifies the accessibility of marketing opportunities from any location within a market system to see if this factor also shaped settlement patterns. Finally, I vary the centres included in the MP variable to determine whether rural settlements responded to the locations of forts in addition to civilian centres. I find that forts did not generally attract settlements and conclude that smallholders sold their produce primarily in civilian market places. In the first and second centuries CE, the Roman Empire established a network of military bases stretching from the mouth of the Rhine to the mouth of the Danube. In addition to the soldiers, their families as well as merchants and craftspeople who depended on the soldiers’ salaries for their livelihood lived around these bases. While imperial officials arranged for the provision of rations to soldiers, their demand for supplementary goods and the needs of the civilians would have been filled through other mechanisms. If this included market exchange between soldiers and local peasants, military bases would have provided important opportunities for locals to engage in commerce and tap into empire-wide networks of exchange (for a more detailed account of the roles of peasants in Roman frontier economies, see Weaverdyck 2016, 1–22). Recent scholarship in the lower Rhine limes zone has contributed significantly to our understanding of the economic relationship between the soldiers who manned the forts and the people living in the countryside (Groenhuijzen and Verhagen 2015; Groot 2008; Groot et al. 2009; Groot 2016; Joyce and Verhagen 2016; Kooistra 1996, 2009; Kooistra et al. 2013; Van Dinter 2017; Van Dinter et al. 2014; Verhagen et al. 2016b; Vos 2009). The question of rural marketing in particular has been studied using zooarchaeological remains (Groot 2016; Groot et al. 2009). In particular, Wouter Vos has argued that the military bases and their attendant settlements acted as local market centres (Vos 2009, 226–229). These studies have not only thrown the impact of the military in the area into sharp relief; they have also highlighted the agency of the local inhabitants in seizing the market opportunities afforded by the presence of soldiers. At the same time, there are some indications that the rural inhabitants might not have been in particularly close contact with the soldiers on a day-to-day basis. Network analysis has revealed that most local travel occurred well south of the major military highway (Groenhuijzen and Verhagen 2015). This contribution seeks to shed new light on the problem using location analysis . Locations of settlements can provide evidence for marketing practices because distance constrains marketing opportunities. Transportation costs in time, money, and other resources can make it impossible for producers to sell their products in certain places. Similarly, if the sale of products is important, production will occur in locations close to markets. The spatial relationship between production and markets was first rigorously studied by Von Thünen in the nineteenth century. His famous model of an isolated market place surrounded by concentric rings of land use of declining intensity remains influential in archaeology today (Bintliff 2002; Casarotto et al. 2016; De Neeve 1984; Goodchild 2007, 31–35; Morley 1996; Patterson 2004. For critiques, see Horden and Purcell 2000, 115–122 and Witcher 2008). Von Thünen’s basic insight was that the combination of the price of a crop, its production cost, and its transportation cost would encourage the intensive cultivation of land nearest to the market (Von Thünen 1966 [1842–1850]; Haggett 1965, 161–167). Because the actual crops produced and the precise agricultural strategies of ancient agriculturalists are difficult to determine, settlement density is sometimes used as a proxy indicator for intensity of cultivation (e.g. Casarotto et al. 2016; Patterson 2004). Of course, transportation cost varies depending on the product being moved, and this has important consequences both for the spatial distribution of production and for the economic strategies of producers. For instance, many animals can transport themselves and require only a herder. While grain is bulky and must be carried, it also preserves well, so the transport of grain need not be frequent if one can invest in storage facilities. Fresh fruits, vegetables, and flowers, on the other hand, are lighter, but spoil quickly and so must be moved as soon as they are harvested (Morley 1996, 86–90 collects literary evidence for the production of perishable goods near Rome). In addition, these products require greater inputs of labour than grain. This makes the production and sale of perishable goods more advantageous for small-scale producers who lack the capital to invest in storage but often have surplus labour (see Weaverdyck 2016, 4–7 with literature for peasant production and marketing strategies). Thus, a high density of settlement near market centres implies not only the existence of market production but a type of market production that is highly sensitive to transportation costs, which in turn suggests that smallholders may have been directly involved in the sale of their own produce. However, these smallholders relied on their own production for a large portion of their sustenance. The ability to sell a surplus would have been less important than the ability to produce enough to survive, so it would be unrealistic to expect the density of settlements in the Lower Rhine to simply decline with distance to markets without taking into account the productive capacity of the landscape. This paper employs a method of location analysis and comparative modelling that is designed to detect the influence of rural marketing under the assumption that it would have been subordinate in importance to production. The method was first developed to analyse rural settlements in central Moesia Inferior, but it is applicable to any context where a large number of rural settlements can be distinguished from potential locations of exchange (Weaverdyck 2016). It relies on statistical models that attempt to distinguish between locations that contained an ancient settlement and those that did not on the basis of environmental factors. First, the factors influencing production are identified through univariate analysis of settlement territories – discs centred on settlement locations with a fixed radius. Then, these factors are used to create a multivariate logistic regression model, and the fit of the model to the data is measured. Finally, a market potential variable is added to the model to see if it significantly improves the model’s performance. This method also allows for different, specific hypotheses about the marketing system to be tested. The hypothesis under examination is that military bases on the Roman frontier acted as markets for the local producers living in the nearby countryside, making proximity to forts desirable. For each chronological period, I construct two market potential variables: one that includes forts and one that includes only civil settlements. The one that has the greatest positive impact on model performance can be understood to be the closest approximation of ancient reality. If neither improves on the performance of the baseline model , it can be concluded that marketing did not significantly influence settlement locations, either because marketing itself was not important or because the market relations were not meaningfully constrained by transportation costs at the current scale of analysis. This type of narrowly focussed analysis has been referred to as a “scaffolding model ” (Llobera 2012, 503–505). The goal is not to create an overarching model of the rural economy in Lower Rhine region, but to investigate one particular aspect of the economy – marketing – and specifically the role of forts within it. To accomplish this, I take advantage of one of the inherent strengths of quantitative modelling: the ability to rigorously compare the empirical support for competing hypotheses (this advantage has long been recognized. See, e.g. Gaffney and Van Leusen 1995, 370; Kvamme 1988, 386; Verhagen and Whitley 2012, 83). All modelling requires that potentially important factors be transformed into measurable variables, and modellers will often experiment with a variety of transformations to choose the one that produces the most statistically meaningful results. This makes it more likely that the resulting model will be useful in distinguishing areas that were preferred for settlement (e.g. Kay and Witcher 2009; Tourneux 2003; Verhagen et al. 2013). In the present case, the influence of marketing is transformed into market potential variables in accordance with specific hypotheses. If the resulting models fail to effectively identify preferred settlement locations, this too is a meaningful result in that it shows the underlying hypotheses lack empirical support in the currently available data (Weaverdyck 2016, 30–34). 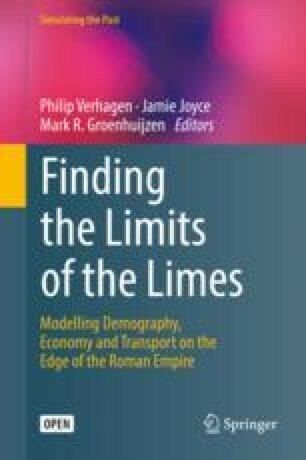 Data suitable for spatial analysis have recently been compiled by Philip Verhagen, Mark Groenhuijzen and Jamie Joyce as part of the project “Finding the Limits of the Limes”. They consist of a palaeogeographic reconstruction of the lower Rhine and a geographic database of archaeological sites dating from the Late Iron Age to the Late Roman period. The palaeogeography of the region was reconstructed by Mark Groenhuijzen using the methods published by Van Dinter (2013). Ancient landform units are represented by polygons in a shapefile. The archaeological data are based primarily on the records of the Netherlands’ national archaeological database, ARCHIS. When individual find spots were located within 250 m of each other, they were aggregated into a single site represented by a point at its centroid (Verhagen et al. 2016a). Settlements and potential market centres were identified on the basis of finds and features. These were categorized as castra (legionary camp), castellum (auxiliary fort), vicus (civil settlement), cult site, or rural settlement. In addition, two civil settlements were classified as cities in specific periods. The canabae, the civil settlement that surrounded the castra in the Middle Roman A period, is treated as a unique type due to its great size. The functional categorization of sites was not exclusive; a site could simultaneously be a castellum and a civil settlement, for example. Crucially, this allows both forts and their attendant military vici to be included as distinct entities within the analysis even when they occupy the same location. Verhagen et al. (2016) calculated the chronology of the sites using a combination of aoristic analysis and Monte Carlo simulation. This resulted in a dataset that allows for the selection of precisely dated sites, ideal for statistical analysis aiming to understand diachronic change. As in Verhagen et al. (2016a), sites where the probability of 10 or more finds coming from a specific period is greater than 50% were selected for this analysis. The date ranges of the chronological periods, the total number of sites, and the number of rural settlements in each period, divided by zone, are presented in Table 9.1. If the locational tendencies of rural settlements are to be used to elucidate marketing behaviour, it is necessary to understand and distinguish the other factors that influence settlement location. Assuming that most rural settlements relied on their own production for the majority of their sustenance, the productive capacity of the landscape must have exercised a powerful influence on settlement location decisions. Other factors, such as security from human and natural threats, might also have influenced settlement location choices, but they are excluded from this analysis for the sake of simplicity. Productive capacity depends on the physical characteristics of the environment as well as the social characteristics of the cultivators, which include the available technology, labour, and the particular goals and strategies of each household. Rather than try to anticipate the relevant combinations of these factors to model productive capacity, I take an inductive approach that identifies influential environmental factors by analysing their prevalence in settlement territories, building on a method developed in the 1990s during the Archaeomedes project (Van der Leeuw 1998, 2003) and extended by Verhagen et al. (2013). Two different sizes of territories were used in this analysis consisting of simple circles with radii of 0.5 and 1.5 km. The former distance is based on the results of earlier cluster analysis which identified particularly tight groupings at this distance (Verhagen et al. 2016a). These territories would contain an area of just under 80 ha, which is a reasonable estimate of the maximum size of a smallholding (Nuninger et al. 2016). The latter distance is based on Chisholm’s cross-cultural investigations showing that the amount of labour invested in fields tends to drop sharply beyond 1–2 km from the settlement. A territory with a radius of 1.5 km represents the area that is likely to contain the fields worked by the inhabitants of a settlement, rather than the extent of a contiguous estate. No attempt was made to avoid overlapping settlement territories. Since it is impossible to prove exact contemporaneity of nearby settlements, and because land can change hands, an exclusive assignation of territory to a single settlement is unrealistic. The study area was divided into three zones to homogenize the environmental constraints experienced by the settlements within each zone as much as possible. These were identified based on a cluster analysis of the palaeogeographic units within 20 km of sites (Verhagen et al. 2016a, Fig. 2).1 The western zone contains large areas of uninhabited peat and few archaeological sites, possibly as a result of fluvial activity in the area. The central zone is characterized by broad floodplains interspersed with levees, and the eastern zone is characterized by large areas of sandy soil interspersed with levees. 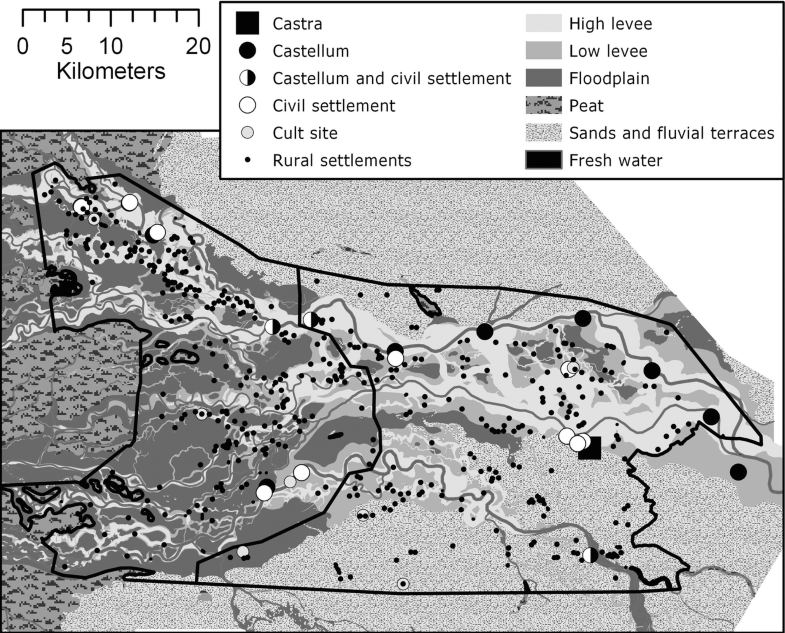 Because of the scarcity of archaeological sites in the western zone, and because of the large areas of uninhabited peat, only the central and eastern zones are included in this analysis (Fig. 9.1). In order to learn about settlement preferences, settled locations are compared to the total area that was available for settlement. Large swathes of the study area were uninhabitable, and these must be eliminated before the other factors influencing settlement location can be identified. To identify the habitable area, all landforms that contained no archaeological sites were eliminated.2 Thus, tendencies observed in settlement locations cannot be explained by the impossibility of living on certain landforms. In this first stage of analysis, the locations of settlements are compared to all the areas available for settlement. The landform classification system was simplified to combine landforms with similar agricultural capacities as described by Verhagen et al. (2016a). This simplified classification is shown in Fig. 9.1 and in Table 9.2. Each simplified landform was converted from the polygon shapefile to a raster with 10 m resolution. Cells containing that landform were coded 1, and the others were coded 0. The Focal Statistics tool in ArcGIS Pro 10.2.1 was used to calculate the number of cells within 500 m and 1500 m of each cell that contained the landform. This was then converted to a percentage of the entire territory around that cell. The Kolmogorov-Smirnov (K-S) test was used to compare the portion of settlement territories covered by each landform to the landscape as a whole.3 The K-S test is a non-parametric test that is able to compare continuous variables from two samples with radically different sizes (Wheatley and Gillings 2002, 136–142). This makes it an excellent tool for comparing the environmental context of archaeological sites to the entire study area (Kvamme 1990). While the K-S test identifies significant differences between settlements and the territory as a whole, it does not show the magnitude or the direction of difference. Effect size was measured using Vargha and Delaney’s A estimate (Vargha and Delaney 2000).4 This test has been shown to be more robust than other measures of effect size with non-normal data (Li 2016). It estimates the likelihood that a randomly selected case from one population will have a higher score on a certain variable than a case randomly selected from another population. If the two populations are identical, the statistic will be 0.5. If all of the members of the first population have higher scores than every member of the second population, the statistic will be 1, and if the opposite is true, it will be 0. Variables with a p value less than 0.05 on the K-S test were selected for inclusion in the multivariate analysis. 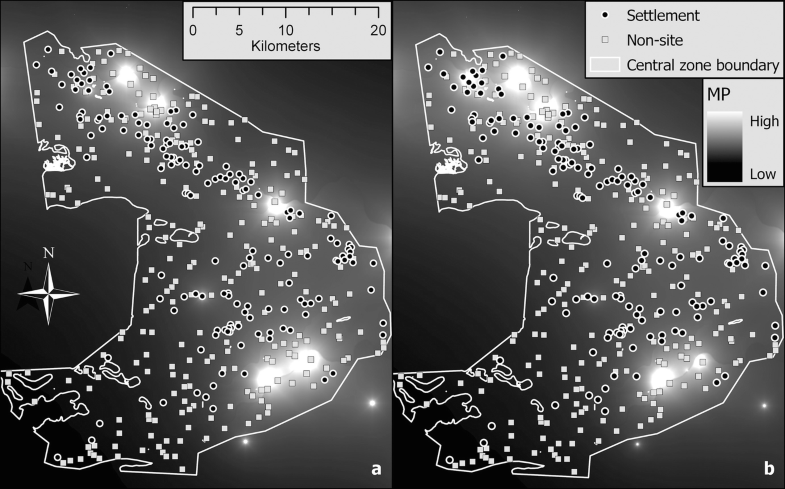 In the second stage of analysis, the variables identified as significant through univariate analysis were combined into a “postdictive”, baseline model using logistic regression analysis.5 This baseline model attempts to distinguish locations with settlements from those without by using only the quantities of landforms found in the surroundings of those locations. Next, a second model was created using the same landform variables as in the baseline model with the addition of a variable quantifying the location’s access to marketing opportunities, a market potential (MP) variable. Improvement in the performance of the model suggests that those marketing opportunities affected the desirability of a location for settlement. The use of logistic regression analysis to study archaeological settlement patterns is well established (Kohler and Parker 1986; Kvamme 1988; Warren 1990; Warren and Asch 2000; Woodman 2000; Woodman and Woodward 2002). The method is able to quantify the relationships between a number of independent variables of different types and a single, binary, dependent variable. In short, it calculates the probability between 0 and 1 that a location with certain characteristics contains a settlement. It also assigns a coefficient to each independent variable expressing whether an increase in that variable makes a settlement more or less likely, as well as a p value quantifying the statistical significance of each coefficient. The root mean square error (RMSE) was used to measure model fit and has the advantage of being relatively simple and intuitive. Locations with a settlement are given a value of 1, and those without a settlement are given a value of 0. The probability of that location being a settlement as calculated by the model is subtracted from this value, and the difference is squared. The RMSE is the square root of the average of these squared errors. RMSEs are calculated for the baseline models and for models containing each of the four MPs in addition to landform data. Improvement is measured as a percentage of the baseline RMSE . The MP variable that improves model performance the most is the most important result. With only 250 non-sites, the results could potentially reflect the characteristics of a particular set of these points rather than settlements. Therefore, for each time period and zone, five different sets of non-sites were constructed. By combining each set of non-sites with the settlements, five unique datasets were constructed for each period and zone, and the entire modelling process was performed on all five. If the same MP variable improves model performance the most in all five datasets, the result is likely to reflect the locations of settlements rather than non-sites. The landform variables analysed in the first stage of analysis pose challenges for logistic regression because some are likely to be correlated. This is both because they are measured in terms of percentage of territory – and therefore must all sum to 100 – and because the processes by which they were formed cause the spatial relationships between them to follow certain patterns. This was confirmed by calculating correlation matrices using the Collect Band Statistics tool in ArcGIS Pro.7 In order to arrive at truly independent variables that capture the character of settlement territories, principal component analysis (PCA) was performed on each dataset of settlements and non-sites. The principal components (PCs) that account for over 90% of the variance were used to construct the baseline models. Unlike landforms , the accessibility of marketing opportunities was measured at the location of the settlement rather than in a territory around it. MP variables were constructed using the archaeological dataset and least cost surfaces calculated from the palaeogeographic reconstruction. Market potential is a measure of the relative accessibility of marketing opportunities from any given location.8 It varies directly with the population or purchasing power of market places and inversely with the distance to those locations. The advantage of using market potential over simple distance measures is that it accounts for the accessibility of all markets in a system, not just the closest one. Two versions of the MP variable were calculated for each chronological period: one that included only cities, civil settlements, and cult sites and a second that included forts as well. In the Early Roman A and Middle Roman A period, further variations on these MP variables were also calculated (see below). Without reliable data on population or purchasing power, it is necessary to assign weights that capture their relative importance to different types of market centres in the system (Table 9.3). Cult sites, which might have hosted periodic markets but had no large, permanent population, are given a weight of 1. Civil settlements – places of permanent habitation with some evidence for permanent population larger than rural settlements – and castella are given a weight of 5. This is based on the average size of auxiliary forts (1.4–3.2 ha for infantry cohorts and up to 6.1 ha for cavalry alae; Hanel 2007) and on the size of the vicus at Kesteren (4.5–5 ha; Groot 2016, 53). There are two places that, at different times, might be termed cities: Oppidum Batavorum on the Valkhof in Nijmegen was the capital of the Batavi in Early Roman periods and occupied an area of around 20 ha. Ulpia Noviomagus in the Waterkwartier in Nijmegen was built after the Batavian revolt and remained an important city throughout the Middle Roman period. Its built-up area was between 35 and 40 ha, but more of this space was occupied by monumental buildings than was the case at Oppidum Batavorum (Willems and Van Enckevort 2009, 69–79). Since precise sizes fluctuated through time, it seems best to give these two cities the same weight of 25, five times the weight of the civil settlements. A castra (legionary fortress) was present at two different periods: the Early Roman A period and the Middle Roman A period. The Augustan period castra covered 42 ha , but was only in use for a few years – possibly less than a decade – and seems not to have been accompanied by a civilian settlement (canabae) (Kemmers 2007; Willems and Van Enckevort 2009). The brief period of its occupancy makes analysis complicated, so two alternative reconstructions were tested. In the first, the fortress is given a weight of 25 because its size is of the same order of magnitude as Ulpia Noviomagus. In the second, it is excluded altogether because of its brief occupation. The second, a Flavian period legionary camp , was only 16 ha, but it was surrounded by a canabae that brought the total built-up area to around 100 ha, far larger than either city in the region. The castra and canabae were occupied from just after the Batavian revolt to 104 CE, when Trajan shifted the legion to the Danube (Willems and Van Enckevort 2009, 56–57), which roughly corresponds to the first half of the Middle Roman A period. This makes weighting difficult. Two alternatives were implemented. In the first, the market is given its full weight for the entire period: the legionary fortress is given a weight of 25 because its size is of the same order of magnitude as the city Oppidum Batavorum. The civil settlement accompanying it was assigned a weight of 75, bringing the total weight to 100. In the second alternative, these weights are halved to correspond to the period of occupation. Distance is calculated in terms of the time it would take to walk to each market centre. The travel-time model employed here is the same as the one used by Groenhuijzen and Verhagen (2015, 2017). In contrast to most other distance models, it relies on assigning coefficients to land cover classes rather than slope, which is appropriate since the study area is mostly flat (see Table 9.1 for coefficients). Cost distance surfaces for every possible market were computed using the Cost Distance tool in Esri’s ArcGIS Pro 10.2.1. For each time period, the MP variables were calculated by taking the inverse of each cost surface, multiplying it by the appropriate weight, and summing the results. The univariate analysis showed fairly consistent results across time periods. In both zones, at both territorial radii, and in every time period, the K-S test showed that settlement territories had significantly different amounts of high and low levees from the habitable zone (p < 0.05). In the central zone, floodplains also differed significantly at both territorial radii and in every time period. In the 1500 m territories, peat differed significantly in every time period, as did fresh water, with the exception of the Early Roman B. The p values for sands and fluvial terraces in the 1500 m territories were consistently low, but only dipped below the 0.05 threshold in the Mid-Roman periods and in the Late Roman B period. In the eastern zone, the results of the K-S test were more consistent between the two settlement territories. In addition to high and low levees, sands and fluvial terraces always differed significantly from the habitable zone. There were also differences in the area of the 1500 m territories covered by fresh water in the Late Iron Age and the Early Roman periods, but in the Early Roman B period, the p value was above the 0.05 threshold. The estimation of Vargha and Delaney’s A statistic showed that, while the differences between settlement territories and the entire habitable zone were statistically significant, they were often small (Fig. 9.2). The largest effect sizes are found in the central zone settlements’ preference for high levees, but even here the A statistic never rises above 0.75. Figure 9.2 displays the A statistics for landforms in each zone and territory size. To ease interpretation, 0.5 has been subtracted from each value, so that landforms that are more prevalent in settlement territories have positive values and those that are less prevalent have negative values. These results demonstrate that levees were consistently favoured and other landforms either ignored or avoided. In the central zone, high levees were most preferred and floodplains avoided, while in the eastern zone, low levees were the most preferred and sandy soil was avoided. The high A statistics for low levees is a result of their relative prevalence in the eastern zone as a whole, where high levees are more common. The average percentage of settlement territories covered by high levees is actually greater than low levees, but many locations in the eastern zone have very high percentages of high levee in their territory, so the settlement locations are less unusual in this regard. Within this pattern, some diachronic trends can be observed. In the central zone, in 500 m territories, the A statistic decreases for high levees and increases for low levees until the Middle Roman A period, after which they separate again. At the same time, the A statistic for floodplains in 1500 m territories rises until the Middle Roman A period before falling again. This mirrors the results of the cluster analysis performed by Verhagen et al. (2016) on all rural settlements in the Lower Rhine. They identified clusters of sites whose 500 m territory was dominated by one landform and found that the proportion of sites in the “floodplain” cluster peaked in the Middle Roman A period at the expense of the “high levee” cluster. In the eastern zone, there is a distinct jump in the A statistic for high levees in both 500 m and 1500 m territories, which is accompanied by a drop in the A statistic for sands and fluvial terraces, in the Early Roman A period. The gap narrows slightly in the Early Roman B period and then remains stable until the Late Roman B period when the A statistics diverge further. The baseline logistic regression models were only moderately successful at distinguishing settlements from non-sites on the basis of the landforms in their territories. Nevertheless, some diachronic trends emerge. RMSEs fall in the eastern zone between the Late Iron Age and the Early Roman A period. In both zones, they rise until the Mid-Roman periods before falling in in the Late Roman A and beginning to rise again in the Late Roman B (Fig. 9.3). This is the same trend as observed in settlement numbers suggesting that as population increased, settlement extended into more marginal areas that resemble non-sites in their territory profiles. Alternatively, factors other than the landforms present in settlement territories could have been influencing settlement location. The addition of MP variables improved model performance little – never more than 3% – but their contribution was often statistically significant. The results are presented in tabular form in the appendix. Beyond the percentage of improvement, three pieces of information are encoded in these tables: which MP variable improved model performance the most within each settlement/non-site dataset, the statistical significance of the MP variable (p < 0.1 or p < 0.05), and the sign of the coefficient. The Late Iron Age, with no forts, had only one MP variable. In the eastern zone, it was significant for 4/5 datasets with 500 m territories and 3/5 datasets with 1500 m territories (p < 0.05). Proximity to larger centres, then, seems to have been attractive in the late Iron Age, at least in the eastern zone. In the Early Roman A period in the central zone, no MP variable consistently improves model performance more than the other nor were any of the variables significant. In the eastern zone, the MP variable without forts consistently improves model performance most with both 500 m and 1500 m settlement territories, but it was significant (p < 0.1) in only two of the datasets with 500 m territories. Maximizing access to markets might have mattered somewhat to some people at this early period, but the impact was small. If marketing did matter, however, the market system was centred on the civilian settlements, not the forts. In the Early Roman B period, in the central zone, the civilian MP variable always outperformed the variable that included forts when examining 1500 m territories. This variable was significant in 3/5 datasets, and the coefficient was consistently negative. This makes the role of forts difficult to understand. Rural settlements seem to favour areas far from markets, but the effect is less pronounced when forts are included. The eastern zone settlements show a slight tendency to favour civilian centres over forts, but significant MP variables are almost entirely confined to a single dataset. As in the previous period, evidence that proximity to markets shaped settlement location trends is weak, but there is no evidence at all that forts attracted settlements. The Middle Roman A period shows more consistent results. In the eastern zone, civilian MP variables consistently outperform civilian and military MP variables at both sizes of territory. The variable that assigns a weight of 37.5 to the canabae around the legionary castra performs better than the variable in which the canabae has a weight of 75. The former variable is significant in three out of five datasets, while the latter is significant only once. Therefore, despite the great size of this settlement, it did not completely dominate the rural market. The Middle Roman B period shows inconsistent results in terms of improvement. Significant variables are confined to the eastern zone where three datasets produced at least one. These improvements were also the largest of any in the analysis: 2.69% in the eastern zone using 1500 m territories and the civilian MP variable. However, both variables performed well: the civilian MP variable performed best three times with 500 m territories and four times with 1500 m territories. It seems that proximity to market centres was more attractive at this time than any other, but the evidence that forts acted as market centres is ambiguous. The Late Roman A period was also highly inconsistent and produced very few significant variables. The Late Roman B period produced more significant MP variables than any other. In the central zone, using 1500 m territories, both MP variables are significant (p < 0.01) in every dataset except one, where the p value is less than 0.101. The civilian and military MP variable improves model performance the most four out of five times with 1500 m territories and every time using 500 m territories. As in previous periods, the coefficient is always negative. In the eastern zone, the civilian MP variable is significant in every dataset with both territory sizes, and the civilian and military MP variable is significant in four out of five datasets at both sizes of territory. Which variable improves model performance the most is ambiguous, though. As in the Middle Roman period, proximity to market centres was clearly attractive, but the role of forts remains murky. While much remains obscure, one conclusion is certain: the MP variable that includes forts consistently improves model performance more than the variable that excludes them in only one time and place, the central zone in the Late Roman B period, and in that case it has a negative coefficient. When the results are consistent in other contexts, the MP variable that includes only civil settlements improves model performance more. At the same time, the fact that MP variables had negative coefficients in the central zone complicates the matter. To understand why MP variables so often had negative coefficients in the central zone and the relative improvements of the MP variables, it is helpful to visually compare the distribution of settlements and non-sites relative to each MP variable (Fig. 9.4). Using the civilian MP variable, there are five high MP areas, and the heart of each is devoid of rural settlements but contains several non-sites. Their unusually high MP score allowed the model to successfully identify these locations as belonging to the category of non-sites rather than sites, which explains why the MP variable has a negative coefficient. Using the civilian and military MP variable, a sixth high MP area emerges in the extreme northwest of the central zone. Unlike the others, this area contains a cluster of settlements. Using this variable, high MP values were found among both settlements and non-sites, confusing the model. This cluster suggests that the fort at De Meern might have attracted rural settlement, but in this it was unusual. The shift in location preferences identified in the eastern zone in the early Roman A period supports the idea that there was a shift in agricultural practice already in the earliest phase of Roman occupation to supply the new population. Maaike Groot has recently shown that livestock production changed in the early Roman period with an increased emphasis on sheep and a focus on meat production in cattle (Groot 2016, 211–215). Laura Kooistra has emphasized the presence of cereals in Nijmegen and Vechten from this period that could have been locally grown and pointed out the possibility that grain was grown around Meinerswijk and that spelt might have been grown at the behest of the army (Kooistra 2009, 223–226). Groot further argues that, with the exception of the initial conquest, rural producers had a fair degree of freedom in how they responded to the increase in demand (Groot 2016, 213). If the rural settlements did indeed favour proximity to civilian centres, this would support the notion of a mutually beneficial relationship between occupiers and rural producers. At the same time, the fact that the civilian MP variable outperformed the civilian and military MP variable suggests that the new forts themselves did not attract many settlers. Farmers are more likely to have sold their products in civilian markets. Changes in land use in the central zone are identifiable in the Middle Roman A period, when more settlements have territories that contain larger areas of floodplain and low levees rather than high levees. This coincides with the peak in the RMSEs of the baseline models. With no significant MP variables and negative MP coefficients, there is no indication that the inhabitants of the area were compromising the quality of their land in order to maximize marketing opportunities. Either population pressure was forcing people to inhabit less desirable locales or a large portion of the rural population preferred floodplains. The first option seems unlikely as the number of sites increased in the Middle Roman B period, but the RMSEs of the baseline models fell. Areas with high water tables would have been unsuitable for arable agriculture but well suited to animal husbandry. On the basis of zoological remains and an increase in the sizes of granaries, Groot has argued that both arable farming and animal husbandry intensified in the Middle Roman period (Groot et al. 2009; Groot 2016, 125–128, 215–218). Horse breeding, in particular, became very important in the Middle Roman B period, but increases in the proportion of horse remains are already visible in the Middle Roman A period (Groot 2016, 87–90). Furthermore, variations in species proportions between sites have led her to suggest that settlements were specializing to some extent in the production of different animals for market. If some settlements were focusing on raising animals while others were focusing on agriculture, this would explain the greater variety in environmental preferences observed in this period. This would also help to explain why, even as production for market increased, proximity to markets was not particularly appealing. Livestock has very low transportation costs. The increase in granary size in this period is also consistent with the settlement preferences identified here. Wouter Vos has argued that these large granaries collected produce from other rural settlements (2009, 256–257). By bulking cargo in the countryside, fewer trips to the places of consumption are necessary. Again, this reduces transportation costs. While surplus production for market occurred in the central zone, it seems unlikely that most smallholders were selling their produce directly to consumers. If the forts and vici were acting as local market centres, as Vos has argued (2009, 226–229), this function did not influence settlement locations in the central zone. In the eastern zone, the situation is different. The significant improvements achieved by adding MP variables show that settlers favoured proximity to market centres, which could also help to explain the increasingly poor performance of the baseline model. The peak in model improvement occurs during the Middle Roman B period, which fits well with Groot’s conclusions drawn from archaeozoological analysis (Groot 2016). In contrast to the central zone, it seems that access to market centres influenced settlement location tendencies, which in turn suggests that transportation costs were intentionally minimized. This would be consistent with the sale of perishable fruits and vegetables, an undertaking in which the advantages of large landowners are less pronounced than in the sale of grain (Weaverdyck 2016, 4–5), but other scenarios cannot be ruled out. The forts might have played a role in this process, but it was not particularly large. The civilian MP variable outperformed the civilian and military MP variable consistently in the Middle Roman A period and in the majority of datasets in the Middle Roman B period. What is more, assigning massive weights to the legionary fortress and canabae in the Middle Roman A period did not improve model performance as much as assigning them a more moderate weight. Overemphasizing the role of the military only confused the model. The city of Ulpia Noviomagus and the civilian settlements seem to have been the most important market places. These results should not be taken to deny the importance of the army in the economy of the region as a whole. Many of the civilian settlements were closely tied to the army, military demand surely played a major role in stimulating production, and the salaries paid to soldiers brought significant quantities of coined money to the region. What this does show is that the forts themselves, with the possible exception of De Meern in the Early Roman B period, were not particularly important market centres. The economic relationship between the army and rural producers was usually mediated through civilian institutions. The role of the city of Ulpia Noviomagus would have been crucial. This conclusion mirrors the result of my previous study in the central Lower Danube (Weaverdyck 2016). There too I found that forts failed to influence rural settlement locations despite the undeniable importance of the military in the regional economy. This means that cities and civilian settlements should be seen as an integrated part of the military supply network. It also means, however, that forts played a distinct role as centres of consumption but not necessarily of exchange. Comparative logistic regression analysis of rural settlement landscapes has proven to be a useful tool in detecting the subtle influence of marketing behaviour among a population that was likely more focused on production than on transporting their goods to market centres. As with any statistical tool, however, its results require careful interpretation. Improvements in model fit, significance of MP variables, and coefficients of MP variables all proved crucial in drawing conclusions from the results of the modelling process. Furthermore, the comparison data, the non-sites, have as much of an impact on the model as the settlements, so it is crucial to construct multiple sets of non-sites to avoid drawing spurious conclusions. One significant improvement would be to analyse biases in the archaeological record to minimize the risk of placing non-sites in locations that contain undiscovered settlements. As with any approach, the results of comparative modelling are most meaningful when interpreted in light of other evidence. The Lower Rhine region has the advantage of a long history of excellent research on military, urban, and rural sites. Location analysis has reinforced and added nuance to the conclusions drawn by other scholars. The presence of the army spurred agricultural intensification and surplus production for market, but this surplus was exchanged in civilian market centres. If the rural population interacted frequently with military personnel, there is little reason to think these interactions occurred in forts. If the military created a landscape of opportunity on the frontier, peasants seized those opportunities primarily in cities and towns. Some of the sites included in the western zone by the cluster analysis were included in the central zone here because they were geographically contiguous with the rest of the sites in the central zone. Eliminated landforms include oligotrophic sphagnum peat dome, mesotrophic peatland, eutrophic peatland, salt marsh, estuary, open sweet water, and Roman river. This was done in R using the ks.test tool in the stats package (R Core Team 2017). The term “postdictive” applies to mathematical models that are designed to elucidate why known sites are located where they are rather than predict the locations of unknown sites (Citter and Arnoldus-Huyzendveld 2014). There is a chance that non-sites fall in areas where settlements existed but have not yet been discovered. The problem can be mitigated by analysing research and taphonomic biasing factors and subjecting non-sites to the same biases, but this was outside the scope of this project (Weaverdyck 2016, 125–130). The correlation coefficient varies by zone and territory size, but high and low levees are negatively correlated with floodplains in the central zone and with sands and fluvial terraces in the eastern zone. This use of market potential is inspired by Jan De Vries’ use of urban potential in the study of early modern European urbanization (De Vries 1984, 154–67). I gratefully acknowledge the assistance of the “Finding the Limits of the Limes” project in providing me with the data on which this analysis is based. In particular, I would like to thank Philip Verhagen and Mark Groenhuijzen for their help in understanding the structure and genesis of the data. Verhagen and Groenhuijzen also provided insightful comments on an earlier draft of this paper, as did an anonymous reviewer. Their advice greatly improved my methodology, my interpretations, and my presentation of both. Any errors remain my own. The improvement in RMSE achieved by the addition of MP variables is presented in the tables below. N-S stands for non-site and indicates which set of non-sites was used in each model. Each column corresponds to a different MP variable. When multiple MP variables were tested, the maximum improvement for each set of non-sites is written in bold. When the coefficient of the MP variable was negative, the improvement figure is printed in italics. A single set of parentheses indicates that the p value of the MP variable is less than 0.1, and a double set of parentheses indicates the p values is less than 0.05. “Civ” indicates MP variables that include only cities, civil settlements, and cult sites. “Civ & Mil” indicates MP variables that also include castella and castra. “Civ & Mil*” is an MP variable used in the Early Roman A, which contains castella but not the castra. “Civ**” and “Civ & Mil**” are MP variables used in the Middle Roman A period which assign half weights to the castra and legionary canabae. The weighting scheme is described above (see Table 9.2).